The only woman on the stage, she wore a tight-fitting, black trouser suit, lavender-coloured cravat with a blinding white blouse and a crimson handkerchief stuffed in the top pocket. Combined with her long silver-blonde hair and generally regal demeanour, the outfit ensured that she dominated the stage, which was surely her intention. You might think there’s nothing exceptional about a beautiful 68 year-old woman, who is worth between $6-8bn, power-dressing on a big occasion, except that this is Germany. ‘Mutti Merkel’ may be chancellor but the commercial world is overwhelmingly dominated by men in suits. And in Germany, the very notion of women in trousers has long been something of an issue. Indeed the Sud Deutsche Zeitung newspaper headlined next day: “Frau Schaeffler wears the pants” and devoted an entire article to the history of scandalous women in trousers. Until the jazz singer Marlene Dietrich infamously donned them in the thirties for a ball in Berlin, it was illegal for women to dress like men. Even after the second world war, it was considered, if not scandalous, then certainly unseemly. And as late as 1970 there was uproar when a woman MP addressed federal parliament in this shocking garb. So what was the pants-wearing Frau Schaeffler, dubbed the “cunning widow” by Continental’s outraged board, trying to say to the world? According to fashionistas, her message was loud and clear: Women in trouser suits are ‘fully emancipated, self-confident, unbending’. And she did run the show. Schaeffler succeeded in taking over Continental, a firm three times its size, albeit at the price of assuming 12bn euro [$15.3bn] worth of new debt that will load down the combined entity for years. 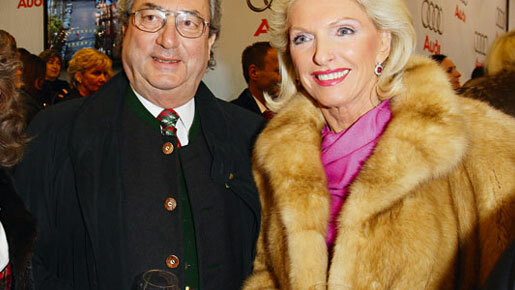 Frau Schaeffler inherited control of the family roller-bearing business in 1996 after the death of husband Georg. It was a great business, supplying advanced bearings to auto-manufacturers around the world, but by her own admission she didn’t know much about the commercial world. In fact, when her former husband first met her, then a 21 year-old medical student from the Czech Republic, he told her the business produced nadellager (ball bearings) but she thought he’d said nagellack (nail polish). Instead of selling the business and spending the proceeds, the widow proved herself highly adept at commerce. She launched herself into the industry with remarkable results, doubling and tripling turnover through astute acquisitions. Immersed in the business, she never had time or even apparently the inclination to remarry. There doesn’t appear to be a man in her life, except for son, also Georg, a US-based lawyer. Similarly, her after-hours interests are impeccably high-brow and worthy. She’s an opera-lover – her two dogs are named Tosca and Amadeus – and throws herself into good works such as buying an organ for a local cathedral, visiting young cancer victims, donating money to this and that. Her only sport appears to be golf and she sometimes plays a round with Adidas boss Herbert Hainer, a long-standing friend. Although she mixes freely with her 8,000 workers and is described as bodenstandig (down-to-earth), “the Schaeffler lady” as she’s known in her home city of Herzogenaurach hardly lives on the cheap. Her house is a castle and her getaway is a traditional wooden lodge where she likes to dress in traditional clothes, like Julie Andrews in The Sound of Music. Over the years her devotion to commerce and good works has garnered Frau Schaeffler a string of awards – everything from Germany’s Cross of Merit 1st class and Austria’s Large Silver Star to various honorary citizenships. She’s also on the board of the University of Leibniz, museums and symphony orchestras. In short, she was very rich and not famous. But all that changed with the audacious takeover of Continental. Made before the financial crisis when the commercial world was awash with debt, it shocked the business world. And it was rather cunning because Schaeffler acquired a 36 percent stake surreptitiously. When Continental woke up, it was too late to fight back. But when the crisis hit, Maria-Elisabeth found herself struggling for resources to fund the bid and was forced to go cap in hand to the federal government and ask in effect for a line of credit. That ill-advised move turned her into the “begging billionaire”, with the media arguing Frau Schaeffler should use a few of her own billions instead of asking for taxpayer support. However, even though you won’t see Frau Schaeffler hanging out with the bunte Illustrierte crowd, she certainly doesn’t mind attracting attention with her classic wardrobe, jewels and threatening trouser suits. It’s hard to believe the “queen of Herzogenaurach” doesn’t know she’s highly photogenic and has learned how to exploit it. She may not be rushing into the limelight but she’s certainly not fleeing it.